Sunil Poudel, chief of Area Administrative Office, Katari, taking fingerprints of Tarka Bahadur Khatri for his citizenship. 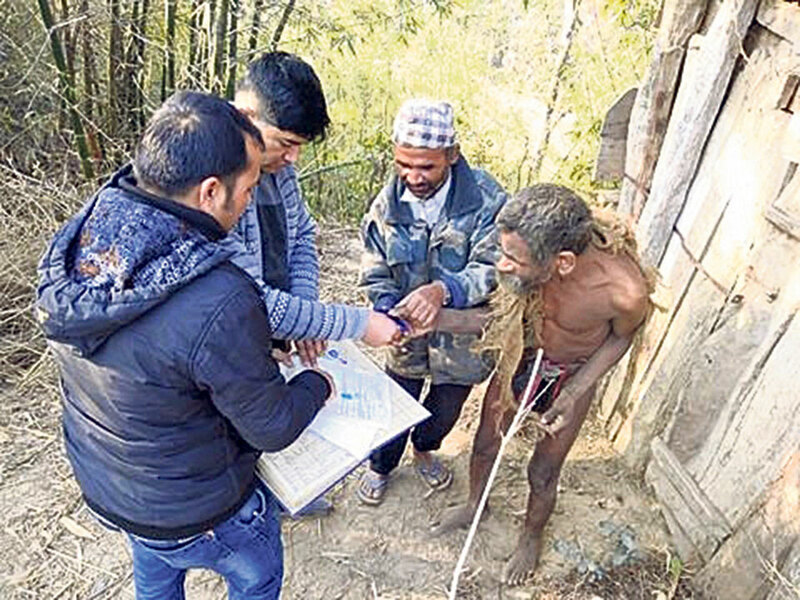 UDAYAPUR, Feb 17: It might be hard for some to believe that the life of a 54-year-old man of Udayapur has been confined to a shed since more than 40 years. Tarka Bahadur Khatri, a mentally challenged person of Katari Municipality -1, Kalikhola has been living a miserable life since years. He can neither speak nor hear. Despite living in the same village, not many people are aware about his existence. As he refused to wear clothes since childhood, he was locked up in a shed, according to his elder sister Indra Kumari Karki. He never wears clothes regardless of the weather. "Women from other families started feeling uncomfortable while visiting us as he always stayed naked,” said Indra Kumari, adding, "As a result, we had no other option than to lock him up in a shed since he was 10 years old." After the death of his parents, his brother Chewan has been looking after him. Unfortunately, he himself cannot hear and speak properly. Despite being aware about the torturous life of Tarka Bahadur, his family has not been able to treat his illness due to financial strain. After learning about his condition, Sunil Poudel, chief of Area Administrative Office on Thursday reached his shed to provide him his citizenship. Few days ago, Tarka Bahadur's relatives had urged the administrative office to provide him citizenship. "We asked for his photos and other documents with his family and reached his home to deliver him citizenship," said Poudel. According to Poudel, he was astonished to see the tragic life of Tarka Bahadur. His family has been managing their bread and butter through agriculture. Chewan does not just cook meal for his brother but also helps in maintaining cleanliness and sanitation of his brother. Tarka Bahadur's family members decided to get him a citizenship after learning that he could receive disability allowance. "It breaks our heart when we see him in such a state but we have no other option," said Indra Kumari, adding, "His life might be changed a bit after getting allowance from the government." She expressed her gratefulness toward the administration for providing her brother with a citizenship in no time.